Nature has a spiritual value for many people, whether they belong to an organised religion or not. For those who are members of religions, a love of nature is often central to their faith. 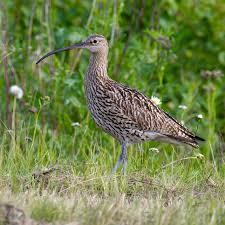 Curlew are wonderful birds that I have loved for ever. It is their almost comical small head, large bill and gangly legs that make me smile and their haunting call that evokes many feelings. Their Latin name is Numenius arquata. I tried to find out why but couldn’t, not at first anyway, but I did find out that Numenius of Apamea (in Syria) was a rather splendid second century philosopher who wanted to restore the ideas of Plato. He believed (putting it very simply) that living things couldn’t be totally explained by referring to matter – which was cold and lifeless – or by the elements – which were in a constant state of change, Numenius believed that life must have some kind of spirit of the divine to animate it. It actually turns out that Numenius is in fact related to the new moon, a reference to the shape of the curlew’s bill, and arquata means shaped like a bow. So the Latin name for curlew is defined by its beautifully curved bill. But I was happy to go with the philosopher because he makes an important point. For much of the world religion plays a very important role in people’s lives. It is only in western Europe that we feel faith is personal and not to be talked about in public. For the rest of the world religion defines individuals and communities, even whole countries. 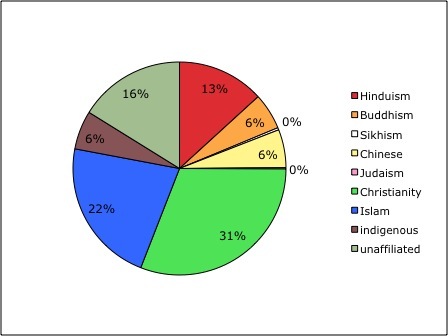 This is a pie chart showing the percentage of different religions worldwide. It is obvious that Christianity and Islam make up more than half the world’s population . Here is a map of the Christian world. Christian countries are guardians of the Amazon, the Boreal forests, the Congo rainforest, sub Saharan Africa, the Arctic – to name a few of the precious ecosystems on earth. Most of N America, the most powerful country on earth, is Christian. Here is a map of the strongholds of the Islamic faith. The Indonesian rainforest is purely in the hands of Islamic countries, as well as most of N Africa. The two biggest religions on earth are in charge of the world’s most diverse ecosystems. It is also a fact that 50% of North Americans say they trust their religious leaders more than any other group (gallup poll) and a BBC World Service survey showed that 75% of people throughout Africa trusted religious leaders over and above governments, NGOs and other civil leaders. Religions also provide an interconnected group of people that spread over the earth, bound together across race, colour and political boundaries. They are are also well established with roots stretching back through generations, tying people to the past as well as providing hope for the future. All religions come with a sense of greatness outside of humanity, of sacrifice for the common good, of awe and wonder, an understanding of obedience and a sense of the long-term that goes beyond human comprehension. Perhaps a good example of this in poetry is God’s Grandeur by Gerard Manley Hopkins. Hopkins was a Jesuit priest. In fact many of the most renowned environmentalists/writers/poets have deeply religious roots, to varying degrees. People like Wendell Berry, John Clare, David Henry Thoreau, Gilbert White, John Muir, Thomas Berry, Thomas Merton, William Wordsworth, Robert Frost. These are just a few I like very much. But what we tend to do in western environmental circles is talk in terms of just science and data, other ways are less important or soft – embarrassing even. This is a shame because all have a place at the conservation table – increasingly so. So whether you see a curlew as a bird with a long nose that makes a lovely noise, or a “thought of God” as Thomas Merton (monk) would have said, or a divine spark of Lord Shiva or a sentient being struggling in the cycle of birth and re-birth aiming for Nirvana or a special creation of Allah or Numenius arquata – any of these are valid and all are important. As we find ourselves in an increasingly religious world we need to embrace different ideas and points of view, because nature needs us to do so.